Being a market leader in the window coverings industry for over 50 years, Aerolux brings the Shadow Glide with its innovation and creativity. This most popular product is a shade and blind and one and is known as the most versatile window covering available. The Shadow Glide is one of Aerolux's most sought after products. Offering the most modern and contemporary look and feel, the Shadow Glide gives you the full option of using it as a complete sheer shade that allows maximum sunlight to shine through or with a slight pull, allows you the protection of a translucent blind. Offering the simplicity and ease in use as a normal roller blind, Aerolux has created a blind that looks stunning and is creatively practical. The dual fabric cleverly overlaps translucent and opaque horizontal stripes, allowing the desired light to shine through. By simply sliding one layer over the other, you can create a variety of gorgeous effects that are modern yet elegant. The Shadow Glide can also be completely rolled up to discreetly fit under the head rail, making it an invisible when it is raised. 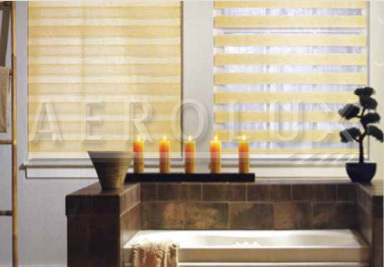 However, when completely lowered, this blind makes a stunning statement with its inherent ribbed textured look. Aerolux manufactures the Shadow Glide on specially designed grooved aluminum profiles with ball bearing inserts for the smoothest lifting and lowering experience. Aerolux offers this most stunning product in an array of colors, patterns and textures. The Shadow Glide is also adorned with a complementing headrail, available in matching colors, including metallics. The blind has been designed and engineered in both a manual cord pull operating system as well as a motorized system that is accompanied with a sleek handheld remote.